Every DJ/Producer has their set of signature synth sounds that they love to use. 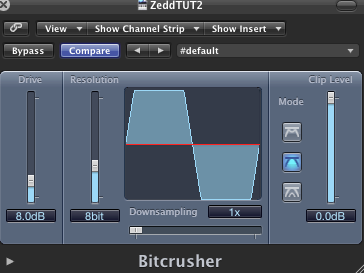 One of Zedd’s staples is a crunchy, in your face, saw bass sound. Listen to his tracks “Shave It” or “Breakin’ A Sweat (remix)” to hear it. This bass sound has many great uses, from dance to dubstep. Open a new sound in FM8. For bass, it is best to set the polyphony to ‘mono,’ which can be done in the ‘Master’ section. This mono setting automatically adds portamento (glide) when you connect notes for smooth playing. Go to ‘Expert’ view and load up a ‘Sawtooth’ wave into Operator F. This sounds much grittier than the original sine wave. Keep its output at 80 to leave some headroom. An important part of this style of bass is the gritty high-end frequencies. In order to beef up the treble in Operator F, use a ’10th Formant’ wave in Operator E to modulate it. Right-click ‘E’ in the FM Matrix to turn it on. Set Operator E’s ratio to 0.5 (one octave down) and modulate F to a level of 100. This results in the “zipper-like” sound we are trying to achieve. Try using a Bitcrusher as well, which FM8 does not have. This requires an external plug-in. When you’re happy with the sound, save it as a preset. Click ‘File’ -> ‘Save Sound As,’ name it, and choose the folder you would like to save in.